The picture on the right is of Scott Hahn's brand new book, Covenant and Communion: The Biblical Theology of Pope Benedict XVI (Brazos). The book deserves a post all its own but I'm absolutely swampted and knowing I probably won't get to doing one any time soon--we've got a new baby coming any day and I'm writing the conclusion to my thesis!--I wanted to mention it here. It's remarkable. 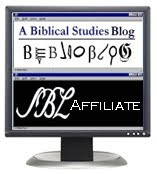 Any serious student of the Bible should check it out. Benedict's insights are profound and Scott Hahn synthesizes them and brings them all together amazingly well. More than that, the book is extraordinarily well-written. 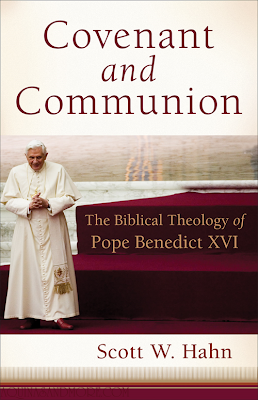 It is more than just a summary of Pope Benedict's thought. It's a thoughtful overview of the basic principles and issues involved in doing Biblical Theology. The chapter on Benedict's view of historical criticism is simply worth the price of the book! Benedict insists that historical-critical study is necessary but he also stresses that this must be with a hermeneutic of faith. What does that look like? Well, you've got to read the book. Notice by the way that the book is published by Brazos. I especially hope non-Catholic Christians interested in biblical studies and theology will check this work out. What they will find in Pope Benedict will no doubt be surprising for them. I know that because I've already heard from them! Go here for many more.